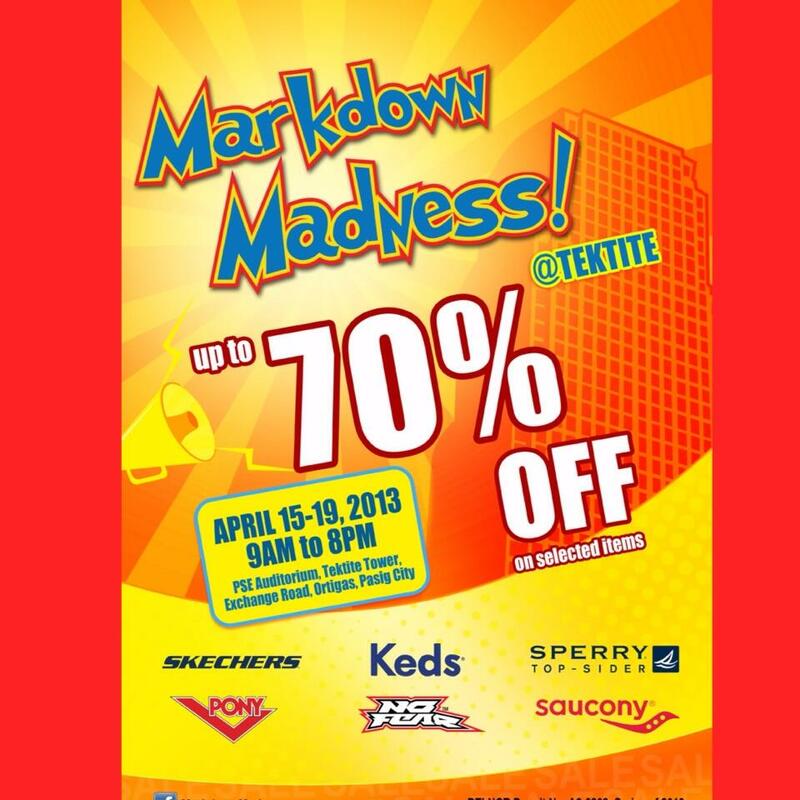 God a word from French high-end apparel brand Lacoste Philippines Cebu branch that they will be holding a sale on their footwear items. 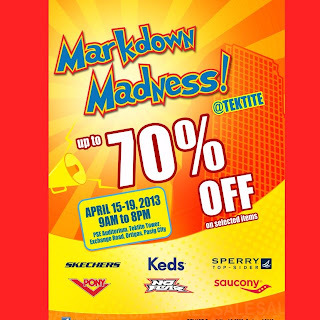 The sale offers up to 50% discount on selected items. 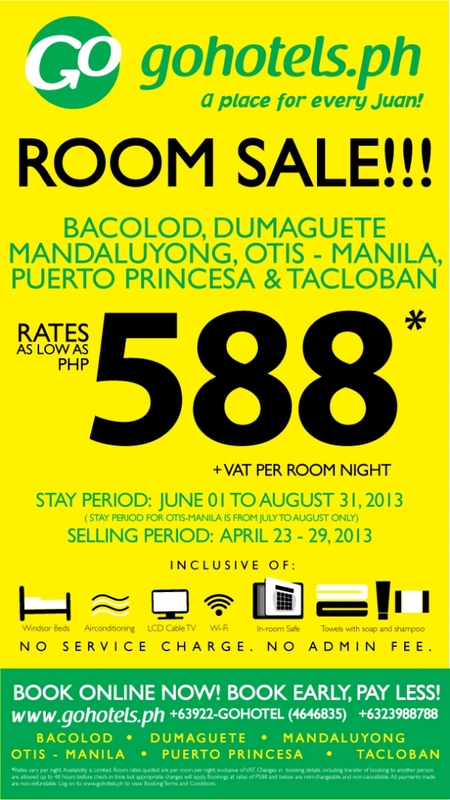 The sale will be from May 31 to June 2, 2013. 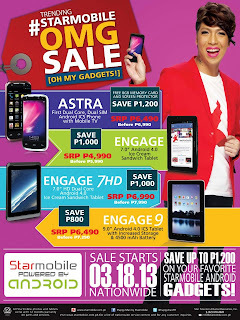 I'm not sure though if other branches will hold a similar sale. 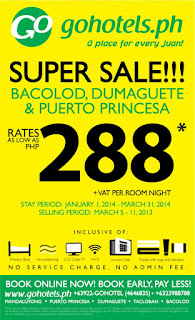 Please contact them to validate. 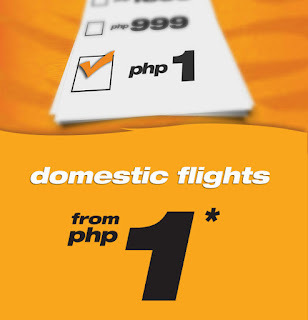 SEAIR - Tiger Airways announces a new Piso Fare promo on all their domestic destinations. The travel dates is from July 1 to September 30, 2013. 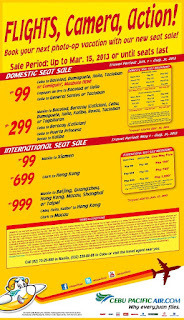 If you want to travel on those dates, it's probably the best time to book your ticket for maximum discount possible. 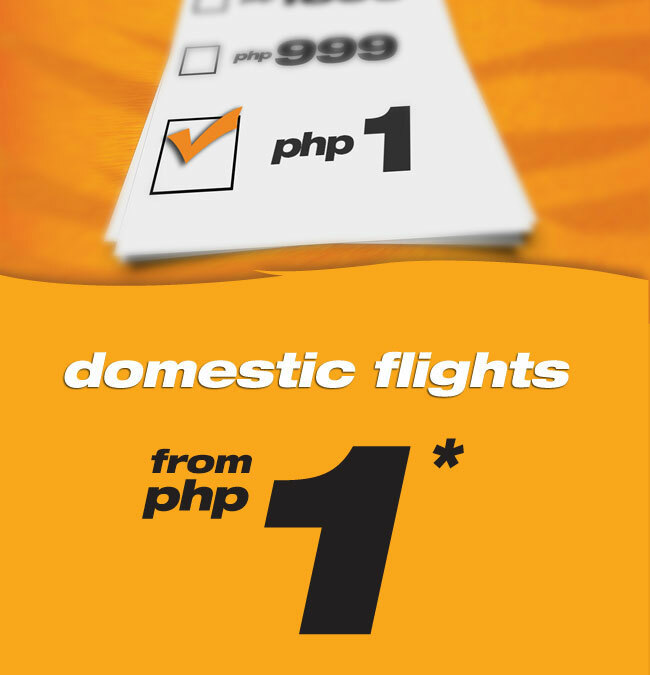 Tickets can be purchased online at Tiger Airways or SEAIR websites or their ticketing offices. 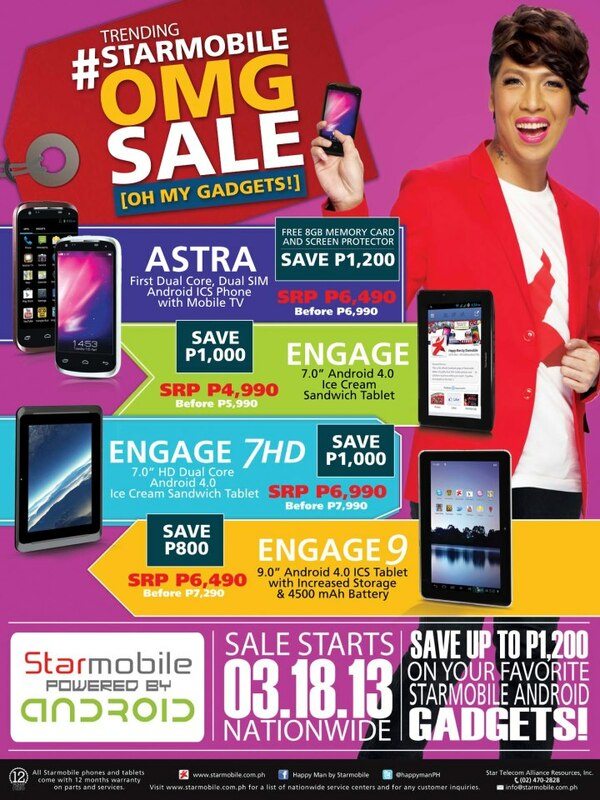 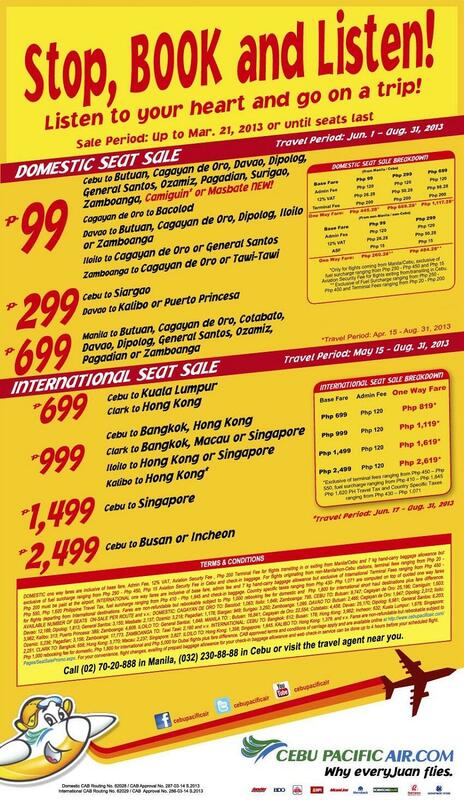 Promo is up until May 17, 2013 only and is subject to seats availability. 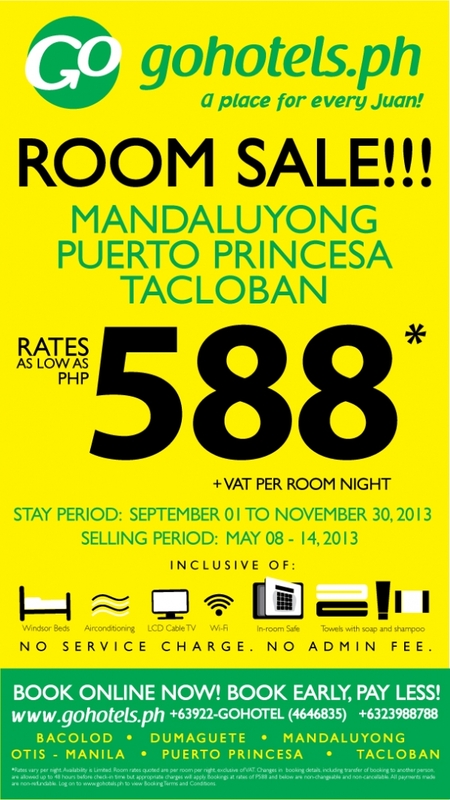 The promo period is from May 8 - 14, 2013 and subject to availability of rooms. 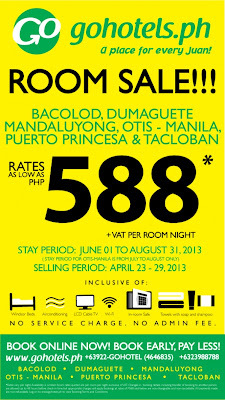 You can book your rooms online at www.gohotels.com.ph or just walk in to the nearest Go Hotel branch. 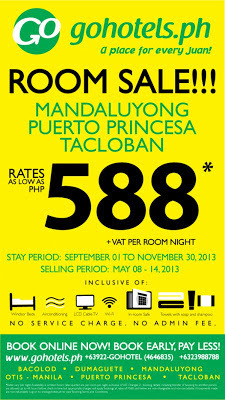 The 588 Pesos is exclusive of the 12% value added tax. 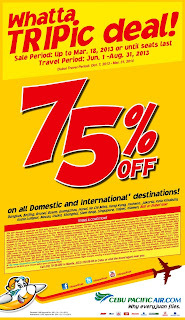 Looking for a nice travel deal? 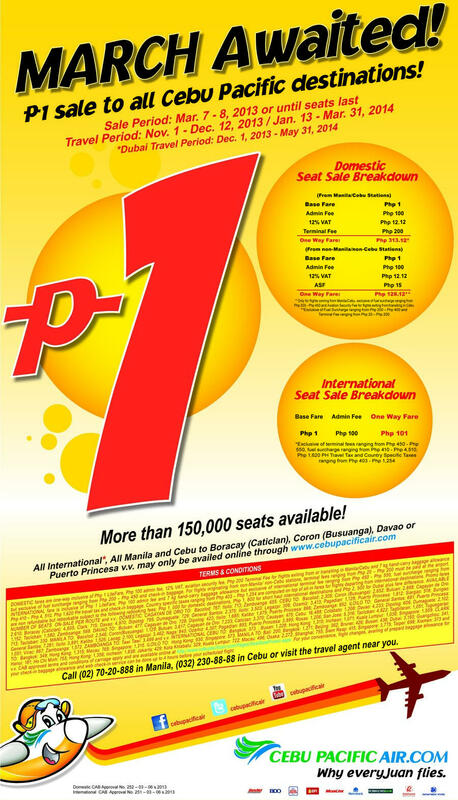 Here's one from low-cost airline Zest Air. 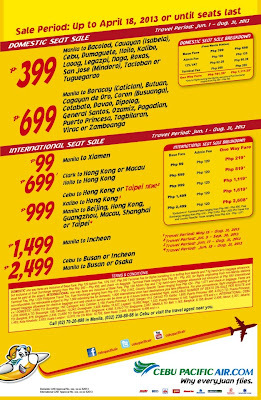 For as low as 1 peso base fare, you can travel to your favorite domestic and international destinations. 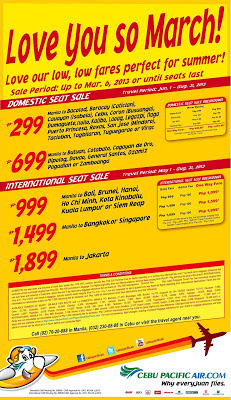 The international destinations refers to Kota Kinabalu, Kuala Lumpur and Shanghai. 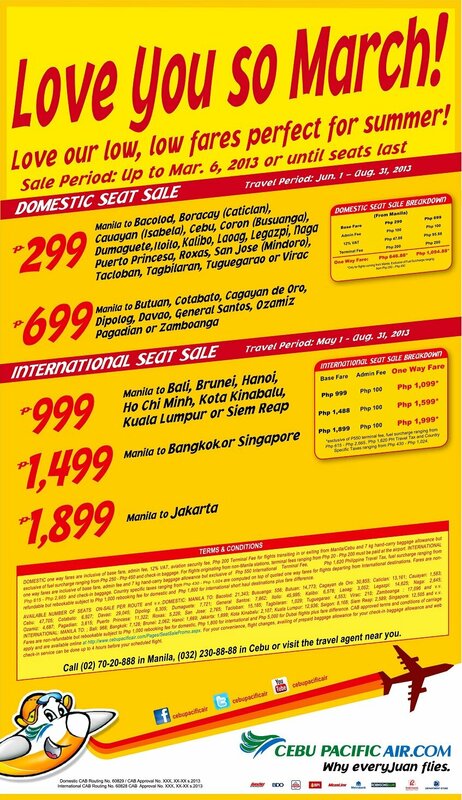 The travel period for this seat sale is from May 10, 2013 to April 30, 2014. 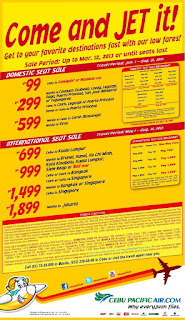 Tickets can be booked at their ticketing offices or online at www.flyzest.com. The promo is valid until May 12 subject to seat availability. 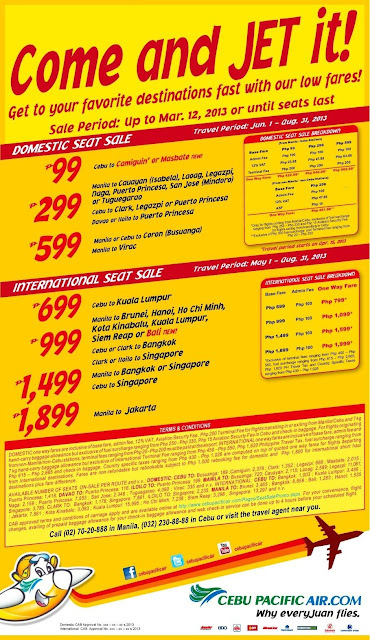 Here's the promo poster from Zest Air. 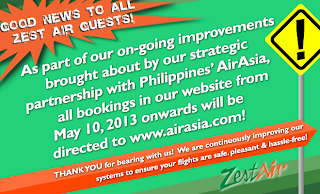 AirAsia website when you try to access Zest Air website. 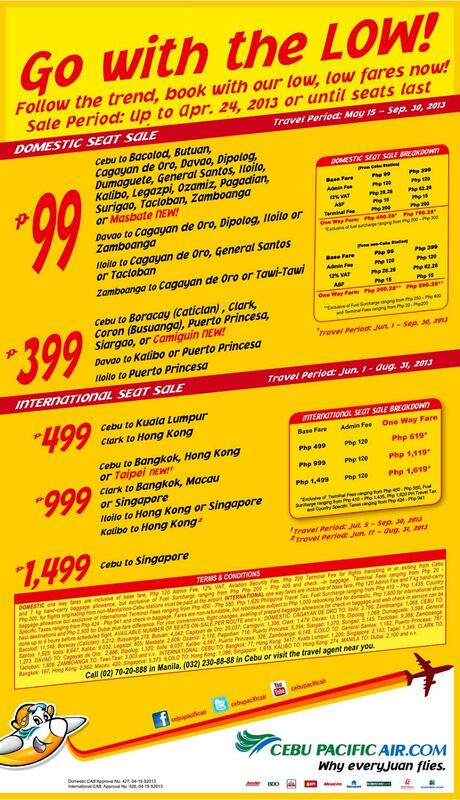 To avoid confusion and utter surprise, it should be noted that the discounted fares advertised by airline companies refers to base fares and does not include other charges that can substantially blow up your bills. 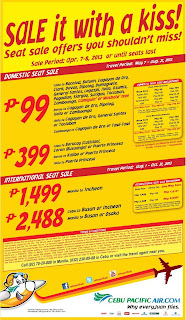 Those charges includes Fuel Surcharge (200-400 pesos), Taxes, Admin Fees and many other airline specific fees. 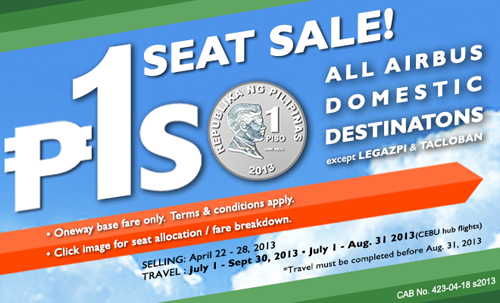 Before paying the ticket, make sure you are aware of them. 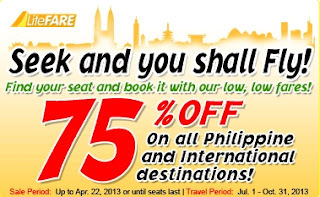 Typically, it was shown while you book you ticket online. 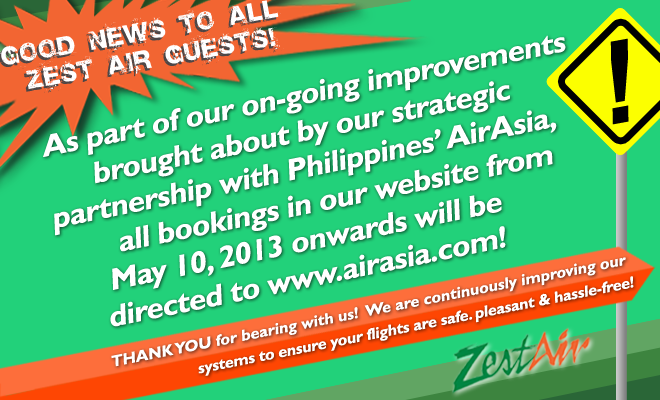 Just look around the webpage. 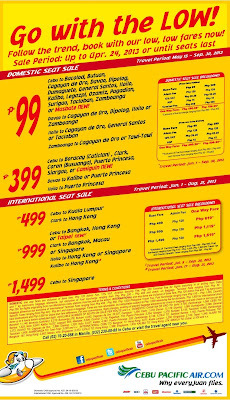 For those booking in ticketing offices, please ask the cashier for that information. 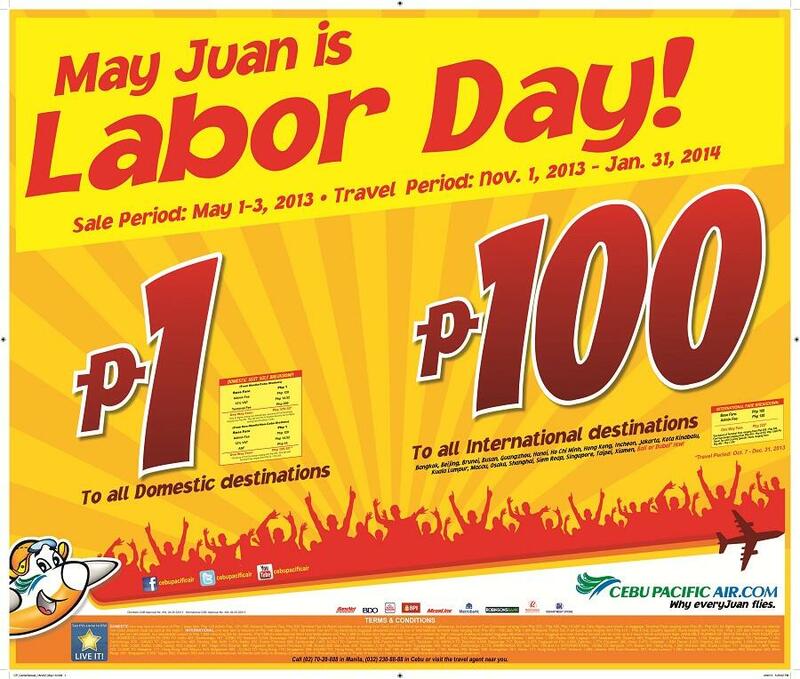 In celebration of the Labor Day 2013, low-cost airline Cebu Pacific announces a new Piso Fare promo. 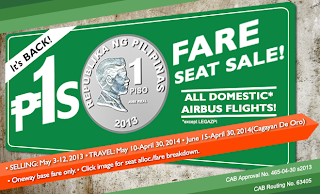 For those still unfamiliar with it, Piso Fare Promos gives one-peso base fare tickets. For this particular Piso fare, all domestic destinations are included. 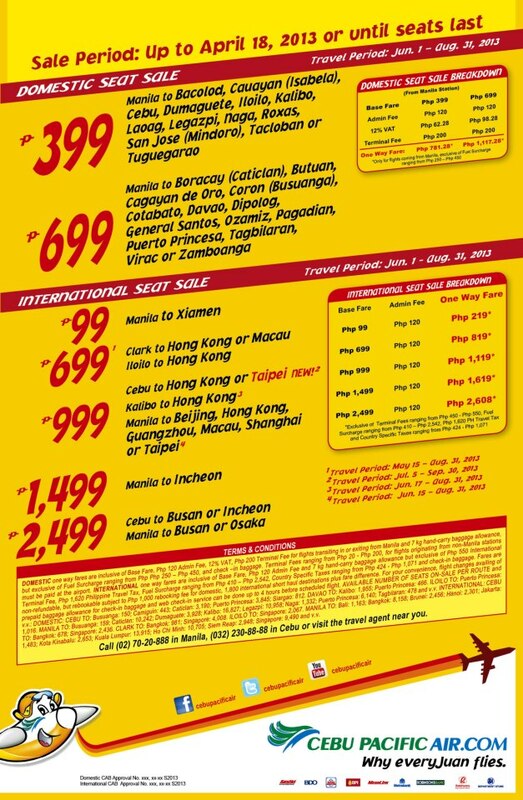 Aside from that, all international base fares were slashed down to as low as 100 Pesos. 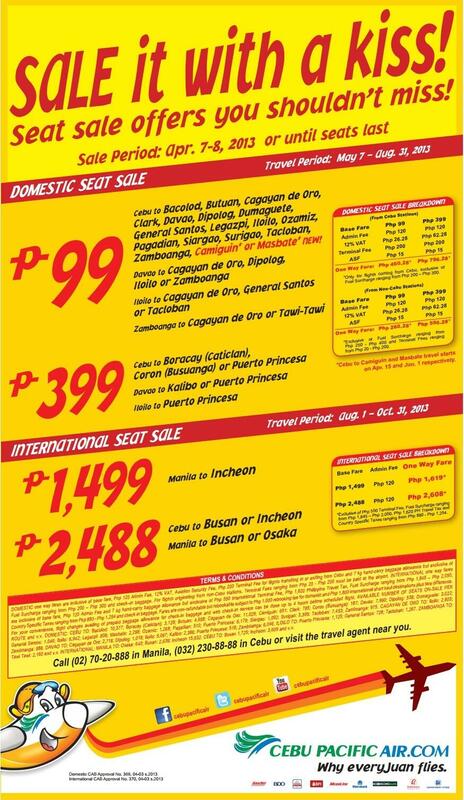 Here's the promo poster from Cebu Pacific. 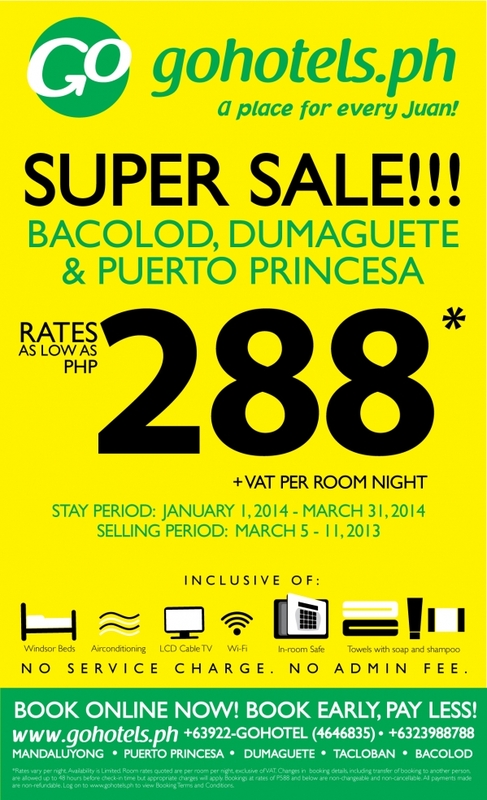 As you can see above, the promo is for those traveling from November 1, 2013 to January 31, 2015. 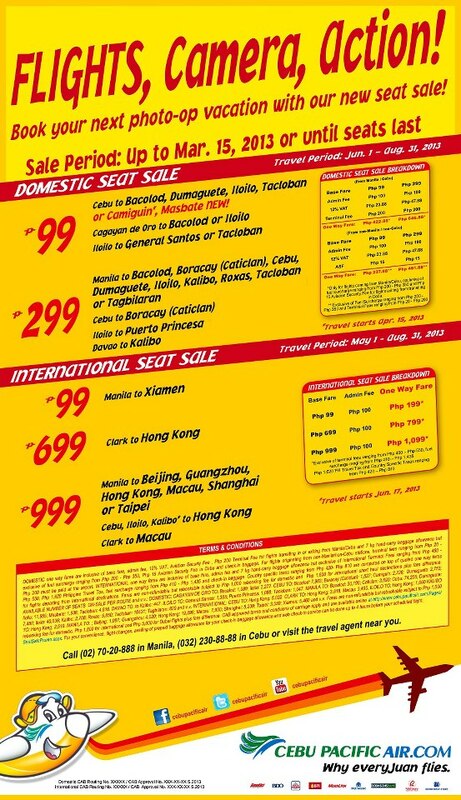 The promo period though is May 1 to 3, 2013 and will depend in seats availability. 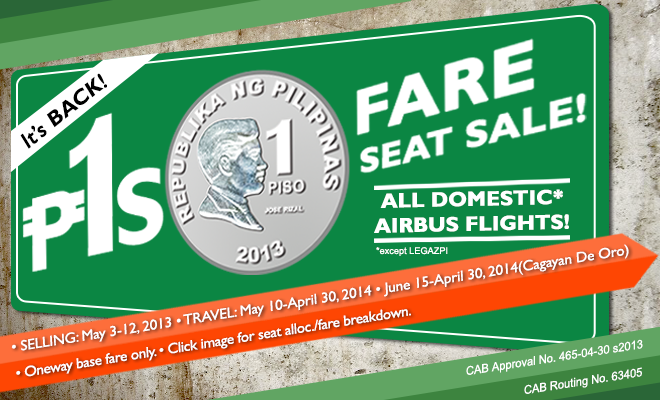 One peso fare is exclusive of charges such as Fuel Surcharge, taxes, terminal fees, and other miscellaneous charges. 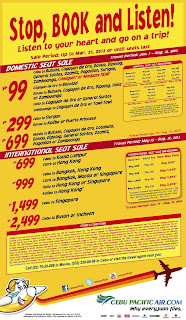 Please make sure you know the final amount so it won't surprise you later.